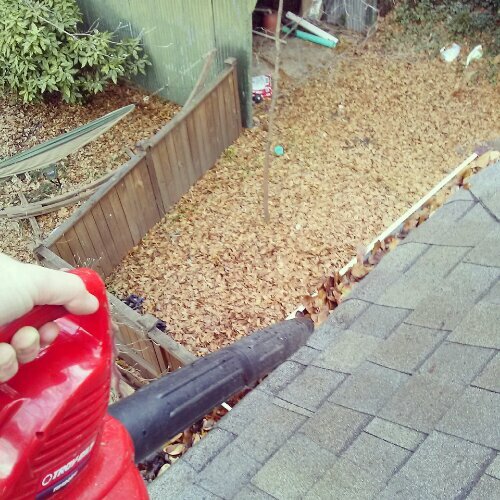 Today was my semi-annual day to climb up the big ladder and, while trying not to wet myself, blow all of the junk out of the gutters. We’ve got two huge old Water Oak trees on the corners of our home, so we get about a million of those tiny little leaves in the gutters. 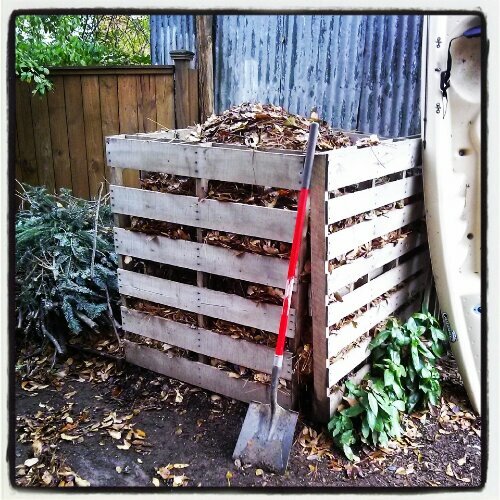 We also filled up the pallet compost bin I built last spring. It gave us some really good compost a couple weeks ago. If you decide to get up on your roof, make sure you’ve got grippy shoes and your roof isn’t too steep. I actually don’t recommend you do this. It’s not safe. This entry was posted in DIY, Exterior Maintenance, Garden, Gutters, Landscaping, Roof, Routine Maintenance and tagged autumn, DIY, Gutters, yard work. Bookmark the permalink.